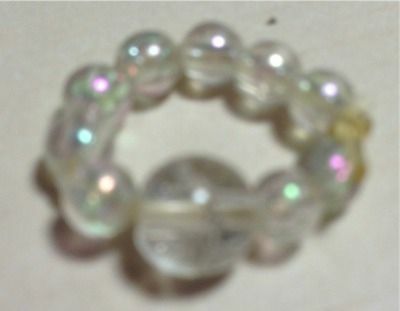 Let's Make A Beautiful Elastic Bracelet & Ring! Making Elastic Bracelets and Rings Is Easy, Fun And Affordable! You can make elastic bracelets and rings so easily, you may never want to purchase another ready-made one! Do your bracelets in themes, by color combinations, to match a new outfit... there are infinite design possibilities! 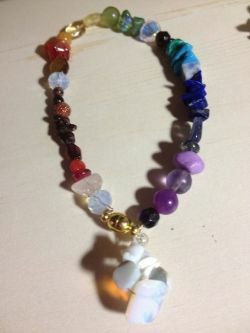 The bracelets in the picture of my jewelry work board are what I call my "Rainbow Bridge Memorial Gemstone Bracelets." They're so simple - a strand of semiprecious gemstones in rainbow colors; Once the bracelet is put together, I create a "focal" or standout bead design to add to the bracelet. The focal is done in a color representing a month that is wished to be remembered. For example, an October departure date would be an Opal; a February one, Amethyst; and so on. Another obvious choice would be to honor other special dates - a Mother's bracelet with the gemstones of her children, a bracelet honoring special birthdays, and whatever your imagination can dream up! When you go to shop for gemstones, you will be amazed at how reasonably priced they are. Most of them are very affordable. Well, enough chatter... let's get to planning on your bracelet and matching ring! Get The Jewelry Work Board I Use! 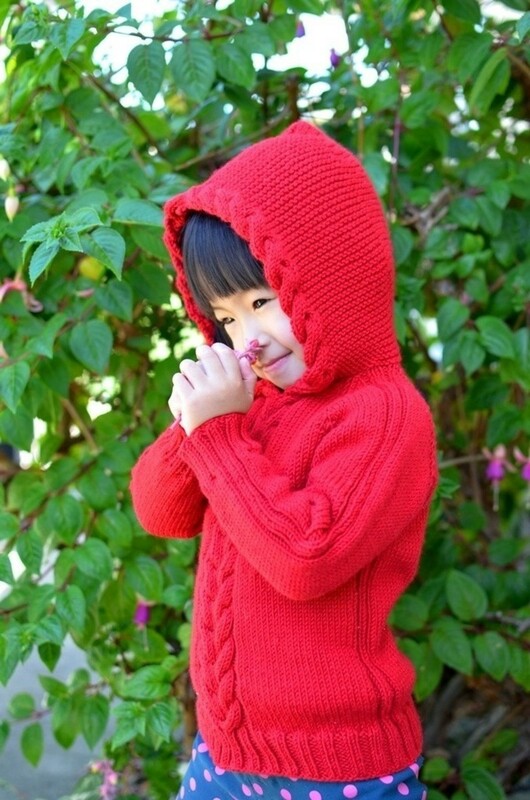 - You Will LOVE It!! I love this board for so many reasons! The flocked surface keeps beads in place. The rounded channel ends make it easy to scoop beads out. The measuring markings are very helpful. The board itself is very lightweight and easy to move. I like this 9 X 12 size because it's easy to put on a small workspace and easy to store. 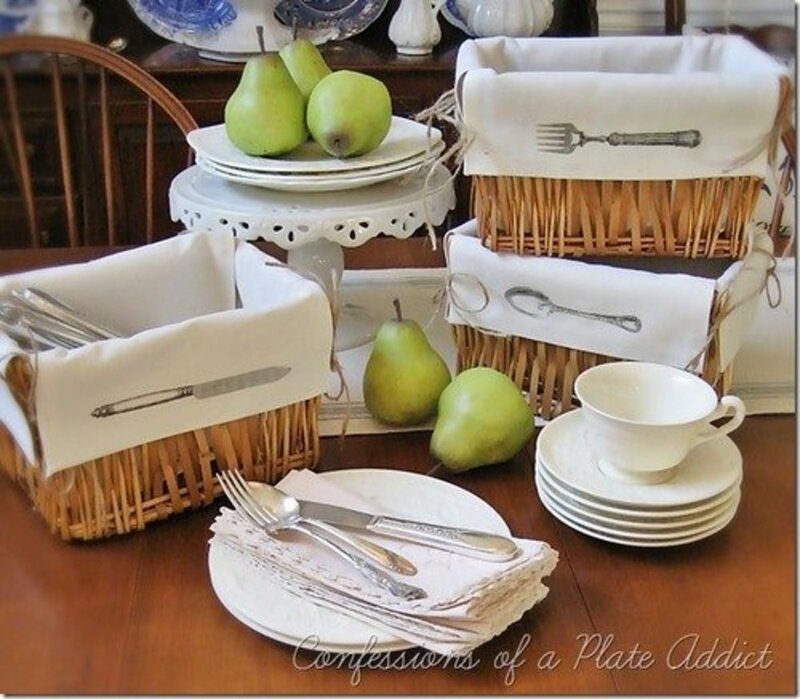 You can tuck it into a small drawer or a briefcase/tote to take with you. Spool of .5 mm elastic. If you want a stronger elastic go with .7 mm BUT remember it is thicker and you'll have to make sure your beads' holes are large enough for the elastic to fit through. Beads of gemstone, crystal, glass, metal.... whatever you love! The first thing you want to do is the most fun part - deciding the order in which your beads will go! You have a few decisions to make. 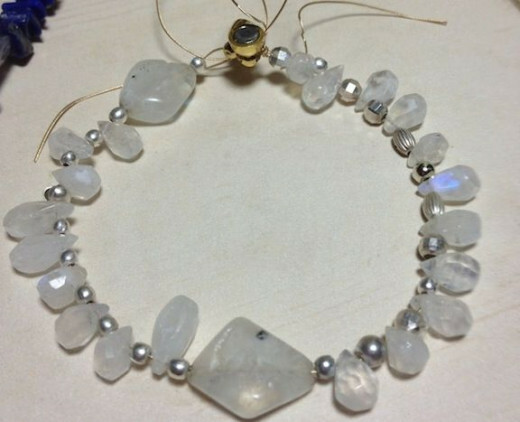 Do you want to use spacer beads between the gemstones/beads? Do you want an organized bead pattern that repeats, or a more freeform design where you just decide which stones look prettiest next to each other? Lay the beads out on your bead board. If you don't have one, use a piece of felt, a towel, something that won't allow the beads to roll around. You want them to stay put! String enough beads to measure the length you want the bracelet to be. String your beads in the selected order. Make sure you're happy with them before you proceed. Place a small jewelry clamp or a clothespin over the elastic just after the bead on each end so they can't fall off. Now cut the elastic about 3-4" from the last bead. Your next step is to the the ends together. 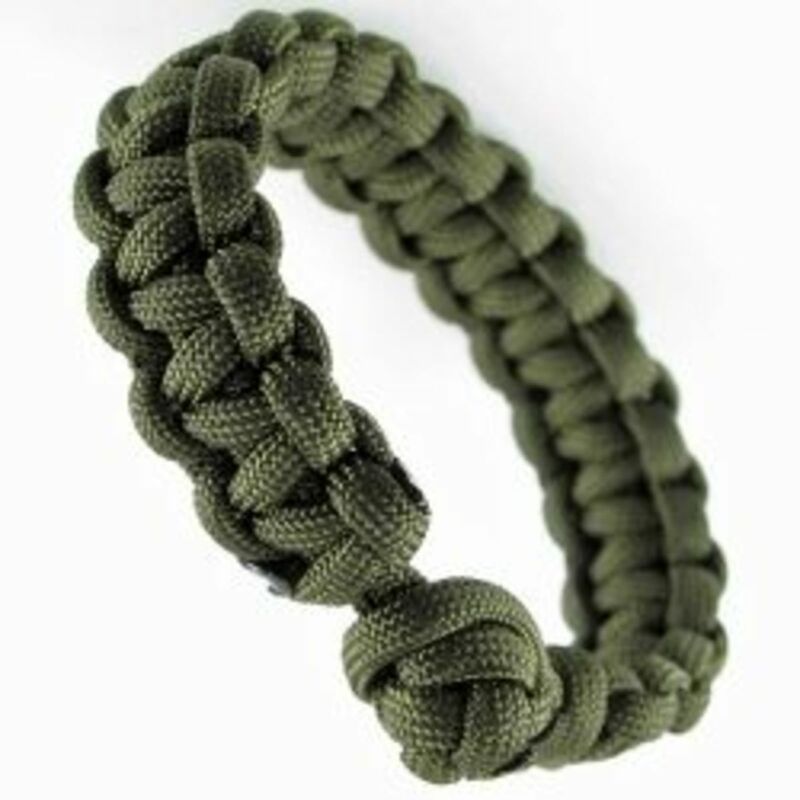 You want the bracelet to be able to stretch enough to go over your hand, so don't pull it tight. Just pull it enough to tie your knot and have little or no space between the beads at either side of the knot. Tie 5-6 knots over each other. These you want to pull tight. Cut each end of the elastic beyond the knot about 1/4" long. 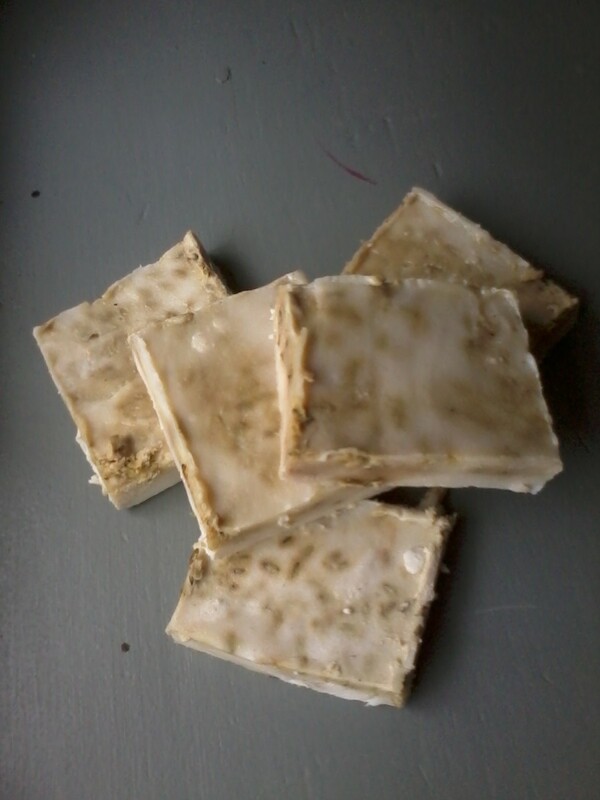 Insert the trimmed end backward through its adjacent bead. Do this on each side of the knot. Squeeze one drop of jewelry adhesive into the hole of the bead to secure the tucked-in end. This will give more security to the bracelet and prevent the ends from popping out. 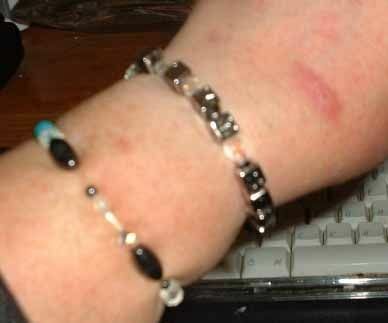 Then try to allow a full day before you stretch the elastic bracelet again. 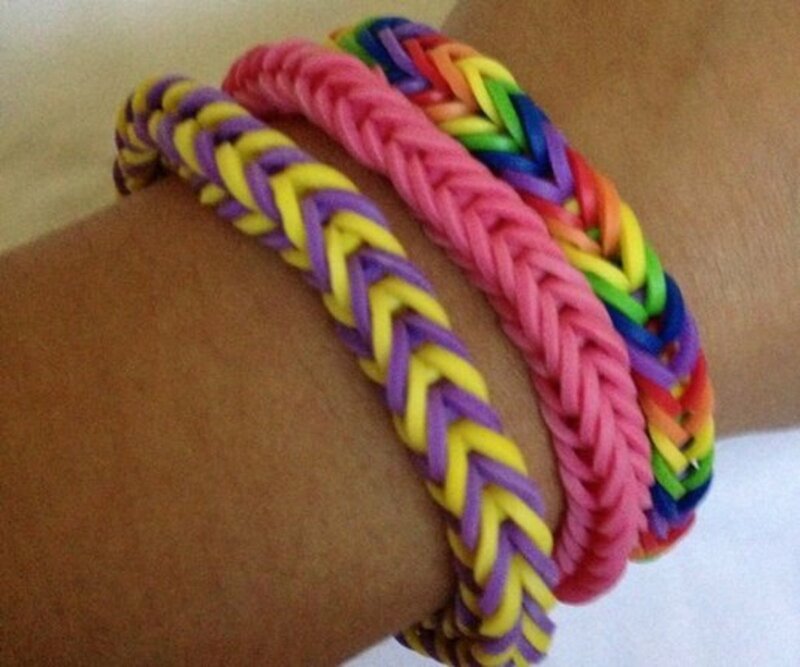 Another Method of Making Bracelets! - Super-Easy Too! Sometimes your favorite gemstones come with very tiny drilled holes, which makes finding something to fit through them a bit of a challenge! A good example is the rainbow moonstone beads shown here (ignore my mess, it's a work in progress!) They are far too tiny for elastic to go through. One of the neat things to use in this instance is called Bead Stringing Wire. In this photo, I used Beadalon Bead Stringing Wire in size .015" (.38 mm) in Gold. This wire is nylon coated which makes it very easy to string beads, and it has just the right flexibility while still being firm enough to go easily through the bead. There are many ways to terminate your bracelet - like every story, it has to have an ending... in this case I used easy magnetic closures. They have a stringing hole on each side and it's very easy to put them onto the bracelet. I slip the whole clasp on the wire, secure with a square knot, then tie 2-3 more knots firmly. 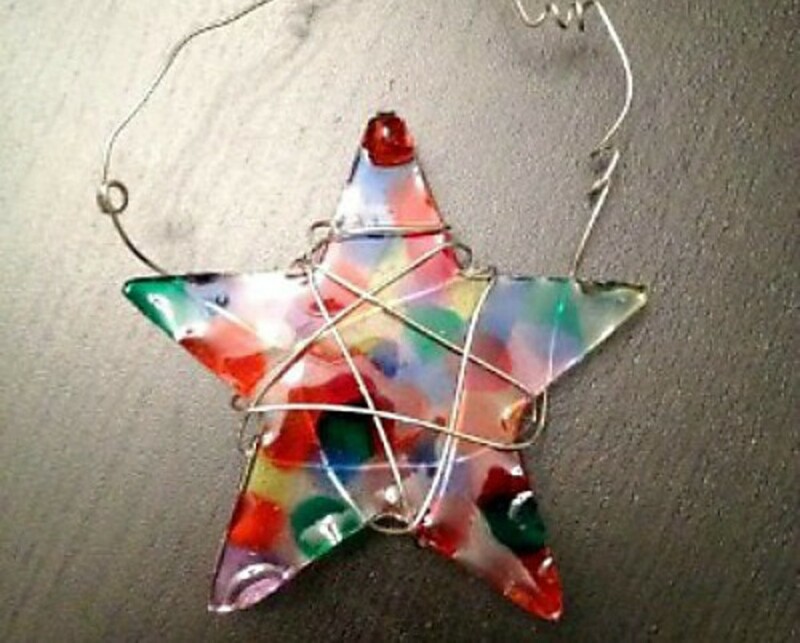 The loose end wire will be strung back through the beads to hide it. Make sure to allow extra room for working with the second end when you cut your wire. You want it to be at least 2-3" longer than your finished bracelet. 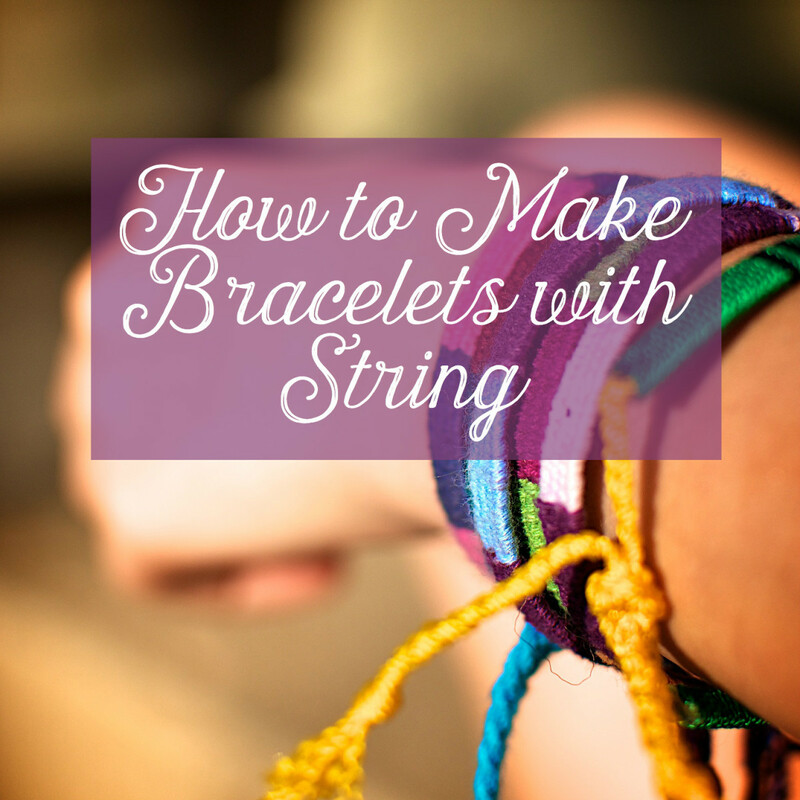 Finish stringing your bracelet, then put on your clasp. Tie your knot as close as possible to the last bead. This is a bit tricky but it just takes patience. you can do it! Trim the loose wire end to about 1/2" and feed it back through a couple of beads, and you are done! Follow the exact same directions as the bracelet but make it a length to fit around your preferred finger. What Do You Think Of This Idea? - Come On, You Can Tell Me! 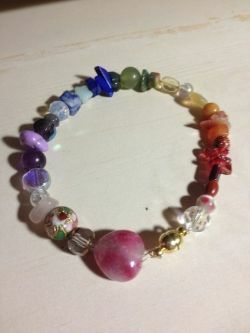 Do you like the idea of making gemstone or glass bead bracelets? Watch the sales at your favorite craft store. Both Hobby Lobby and JoAnn frequently put their jewelry supplies at 50% off. It sometimes pays to wait for a sale! Both of them also offer special coupons via email if you sign up for their email subscriptions at hobbylobby.com or Joann.com . Here are the other supplies you will need! Please Say Hello In My Guestbook! @delia-delia: You are at the beginning of a beautiful addiction! Your jewelry box will be full in no time! And you'll always have a solution for those quick small gifts you need to give! Thanks for stopping by! When my children were young we made necklaces of mountain ashberries! I have tons (literally) of beads and enough elastic to make everyone I meet in a week a bracelet. Great ideas here! The rings are cute too!